When hundreds of African immigrants rioted in the southern Italian city of Rosarno last weekend, the world got a glimpse of a very different Italy from the one pictured in tourist brochures. But while overturned cars, shattered shop windows and street battles may be a far cry from the tranquil villages in the Tuscan hillsides, the real contradiction uncovered by the violence has less to do with how Italy is perceived by outsiders than with how Italians view the country themselves. Demographically, Italy is one of the most rapidly changing countries in Europe. Last year, according to the Catholic charity group Caritas, the percentage of noncitizen residents in the country  7.2%  was greater than Britain's. And in a country where the native-born population is aging rapidly, 1 in 6 babies delivered in 2008 was born to a foreign-passport holder. La dolce vita is also becoming ever more dependent on immigrants and their labor. The International Organization for Migration (IOM) estimates that foreign workers account for 9% of Italy's annual gross domestic product. They pick the fruit in the country's orchards, staff its restaurants and workshops and look after its young and elderly. "If all the migrants just stopped working now, the Italian economic system would collapse," says IOM spokesman Flavio Di Giacomo. Yet the country retains an intensely hegemonic streak. Rigid codes of behavior govern everything from how to dress to the proper time of day to drink a cappuccino. Far from being a melting pot, Italy remains a three-course meal, with the pasta carefully segregated from the appetizer and main course and no place for a bowl of hummus or plate of egg rolls. "People now accept that immigrants are here," says Giuseppe Sciortino, an immigration expert and sociology professor at the University of Trento. "But they're still in denial that they are a presence that will change Italy forever." The violence erupted in Rosarno on Jan. 7 after two African immigrants were shot by white men with pellet guns. The town's immigrants responded by burning cars and vandalizing shops, prompting retaliatory attacks by residents. By the end of the weekend, at least 70 people  most of them migrant workers  had been injured. In the aftermath, the Pope called for tolerance and the government evacuated about 1,000 immigrants to neighboring cities to ensure their safety. The migrants also received uncharacteristically sympathetic media coverage. "This Time ... The Negroes Are Right," read the headline on Jan. 9 in the conservative newspaper Il Giornale. The region of Calabria, where Rosarno is located, makes up the toe of Italy's boot. Seasonal migrants  mostly from Africa and Eastern Europe  have long been employed to work in the citrus orchards there. The hours are long, and the wages average less than $30 a day. 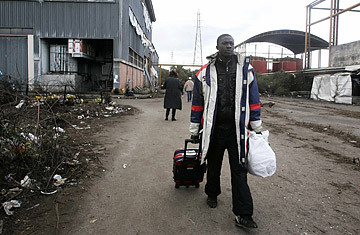 When Fabrizio Gatti, a journalist for the Italian newsweekly L'Espresso, posed as a migrant worker in 2006, he uncovered a world where beatings were common and exploitation was rife. "You have no contract  no rights," Gatti says. "So if they don't pay you, you cannot go to the police." The international aid group Doctors Without Borders  best known for its work in war zones  considers the conditions so bad that it runs a clinic catering to workers who live in abandoned factories with no access to running water or basic health care. "This is a neglected population, and they are the victims of exploitation and violence," says Sophie Baylac, who coordinates the group's migrant programs in Europe. "The situation last weekend is a symptom of the ongoing neglect suffered by seasonal migrants." But not everybody is sympathetic to the migrants. Italian Interior Minister Roberto Maroni, a member of the anti-immigrant Northern League Party, blamed the riots on his country's lax approach to undocumented workers. "For years illegal immigration  which feeds criminal activities  has been tolerated and nothing effective has ever been done about it," he said. Never mind that the IOM estimates that at least half of the evacuated workers now held in reception centers obtained regular working papers. Or the fact that migrant workers make up a vital part of many industries. "It's very difficult to crack down on illegal immigrants because it means cracking down on one of the key structures of the Italian economy," says Sciortino. The challenge for Italy is to match its policies with reality. About 20% of Italy's foreign population is under age 18. Many of these people know no other home other than the land that won't accept them as its own. Italians don't like to think they're racist, but it would be hard to find a dark-skinned resident who agrees. "We're creating a group of people who are heavily marginalized and will react the way that marginalized people react," says Sciortino. If the country wants to avoid clashes like the one in Rosarno, it will have to shift its efforts from keeping immigrants out to finding a way to fit them in. Read "An Italian Town's White (No Foreigners) Christmas." See pictures of Italians in America.